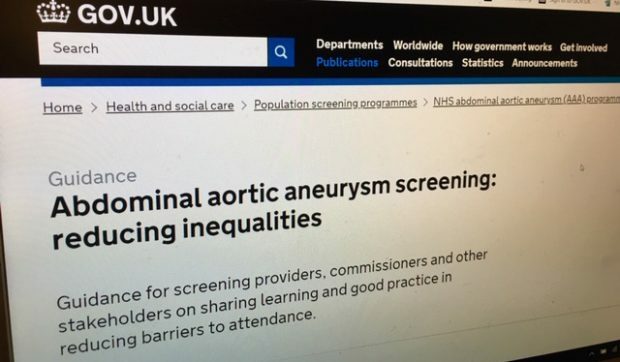 Last year, PHE Screening launched national guidance for abdominal aortic aneurysm (AAA) screening providers, commissioners and other stakeholders on sharing learning and good practice in reducing barriers to attendance. We know men with learning disabilities can find it more difficult to access screening because of unwanted and unfair barriers. The most significant of these barriers can be a lack of awareness and understanding of AAA screening, which prevents men making an informed choice about screening. In this blog article, South Devon and Exeter AAA Screening Programme manager Lynda Pike describes her team’s action plan to help improve access for eligible men with learning disabilities. This has included focusing on the role of carers. Several years ago we developed a care pathway in South Devon and Exeter for men with learning disabilities in collaboration with the screening and immunisation team. It is often not possible to follow the pathway because we do not know which men have a learning disability when we send out invitations. This means we can be unprepared when a man with a learning disability attends for screening. The standard 5-minute appointment slot may not be long enough, we may not have easy read materials readily to hand and may not be prepared for any factors around the man’s capacity to give consent. An audit was carried out in 2015 that found only 6 out of 10 (60%) men with a learning disability attended their AAA screening appointment. Just 15 patients were identified with a learning disability that year. Ten (67%) were successfully screened, one patient died (unrelated to AAA) and 4 were deactivated from the programme following the correct care pathway. We received very little information about men with learning disabilities before appointments – not one single carer contacted the programme. We therefore decided to focus on informing carers proactively about AAA screening. We put together a list of nursing and residential care homes in the area and cross-checked this against the cohort of men we were inviting for screening. A few weeks before sending screening invitations to these men we sent a generic flyer to the care homes. It contained no patient details but gave national information about AAA screening, described some of the support which can be offered and included contact details for the South Devon and Exeter AAA screening service. This helped make sure carers could help men understand their screening invitation and make an informed decision. In addition, the local AAA nurse practitioner, who is also a screening technician, updated a spreadsheet monthly to make sure men with a learning disability moved into the appropriate care pathway for the management of their screening appointment. The nurse practitioner also made contact with the local primary care learning disability liaison team to keep them informed. Using one person for this process helped us build a relationship with the primary care team and ensure a consistent approach. 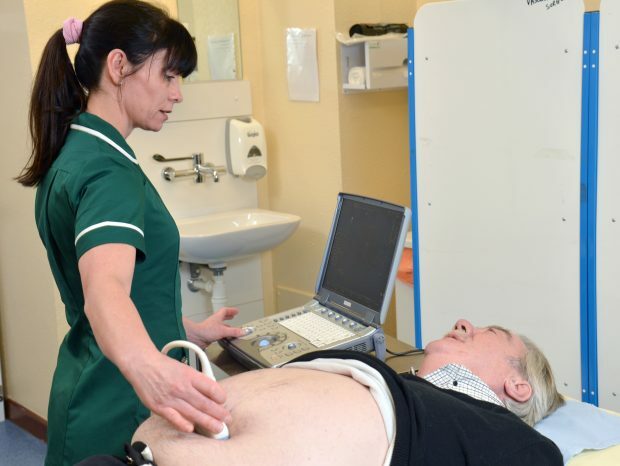 The breast, bowel and diabetic eye screening programmes in Devon also struggle to identify individuals with a learning disability before inviting them. We have therefore worked together with these other services to distribute an easy read overview of all 4 screening programmes to care homes, practice nurses and professional colleagues. This was not a replacement for programme specific information but helped make sure carers had a resource they could use to support people with learning disabilities. In 2017, we carried out another audit and identified 26 men with a learning disability. Of these, 22 (85%) were successfully screened and one made several visits to clinics to meet staff with a view to becoming relaxed enough to be screened in the future. The remaining 3 were deactivated from the screening programme, 2 because they had other serious conditions (co-morbidities) which meant screening was not in their best interests and the third because he could not tolerate being screened despite our best efforts. These are small numbers compared to our annual cohort of nearly 5,000 men. However, these figures suggest an improvement compared to 2015. Each year, the process becomes more embedded and colleagues and the public become more aware and positive about engaging with us. The amount of work involved in sustaining the process is minimal, although the initial planning stage did take time. More carers now contact us ahead of appointments, enabling us to make the best use of clinic time to make visits successful. The national guidance on sharing learning and good practice in reducing barriers to attendance was developed by the 4 Nations AAA Screening Programmes group. In Northern Ireland, health facilitator nurses have responsibility for ensuring adults with learning disabilities can access timely and appropriate healthcare. Health facilitators, speech and language therapists and other healthcare professional colleagues have all helped develop easy read information materials in Northern Ireland. Where possible, health facilitators carry out targeted interventions using these materials. However, data protection legislation has so far prevented the Northern Ireland programme there from identifying men with a learning disability before inviting them.